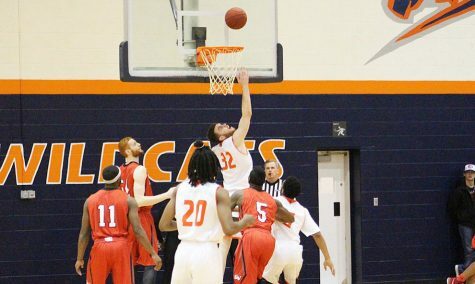 The men’s basketball team fell two times in one week for the second time in conference play this season. The Wildcats lost 60-45 to the No. 11 Benedictine College Ravens Thursday night in Collins Center and lost 64-61 to the Culver-Stockton College Wildcats on Saturday in Canton, Missouri. The Wildcats are now 7-8 overall and 1-4 in the Heart of America Athletic Conference. This was the fourth consecutive loss for Baker to Benedictine. 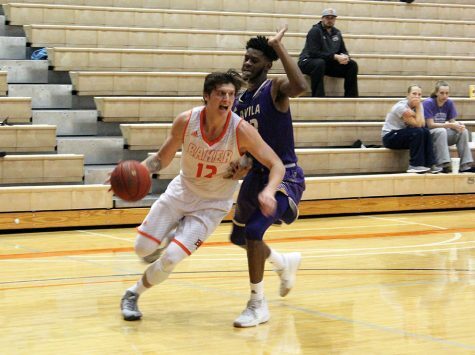 Facing a high-powered offensive team like Benedictine was already a tough challenge for the Wildcats, who were coming off a rough home loss to the McPherson College Bulldogs 75-64 on Jan. 3. 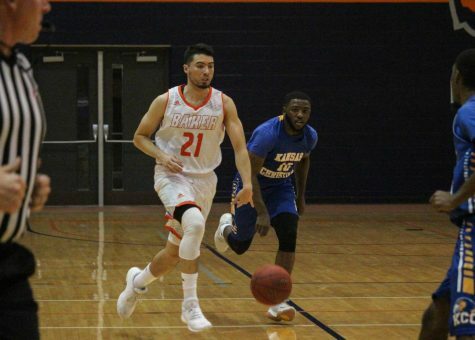 But the team found out just hours before the game that both reigning HAAC Freshman of the Year Javeion Gray and freshman Daniel Young were not going to be able to play. 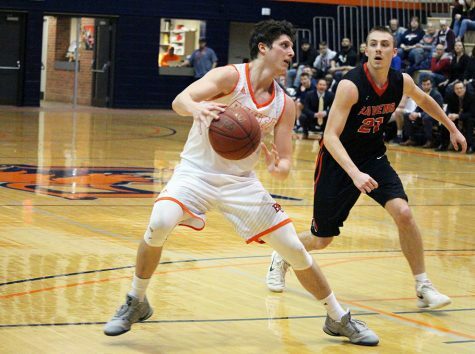 Gray, the team’s leading scorer, was coming off a 24-point game against McPherson. Young at six-foot-seven was a tough player to lose against a tall Benedictine team. 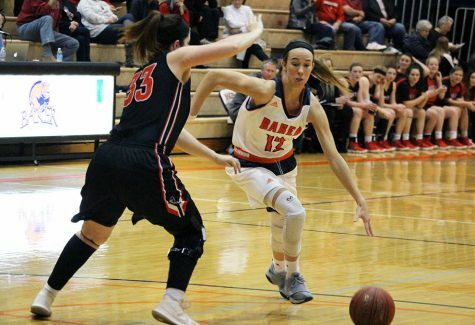 Even without Gray and Young, Baker played tough defense, limiting Benedictine to just 27 first half points. But while the defense was strong, Baker only shot a rough 20 percent from the field and from three-point range compared to 40 percent from the field and from three for the Ravens. Baker could only score 17 points in the first half but luckily only trailed by 10. Junior Nick Wilson led the team in scoring at the half with 6 and sophomore Tyrome Parker grabbed 5 rebounds. Before half, Baker out rebounded the Ravens 22-19 total boards. 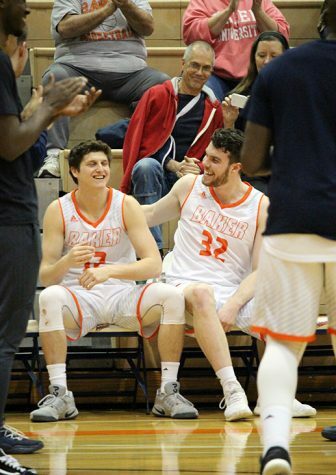 But in ten minutes, following halftime, BC changed the score to 49-32, following two big shots by sophomore Jake Schannuth and senior Brett Fisher. The Wildcats only made 5-23 three point shots against BC, after coming off a 3-17 night shooting from three against McPherson. Benedictine closed out the remainder of the game without much of a threat from Baker and walked away from the Collins Center with a 60-45 win over the Wildcats. Baker’s shooting did improve in the second half and the Wildcats ended up at 27 percent. Senior EJ Carter was held scoreless in the first half but came back to produce 8 points and 9 rebounds on 3-10 shooting. Wilson led all Baker scorers with 13 and senior Jared Fulks went 2-5 from three and wound up with 8. With the addition of an injured freshman Easter, the list of injured Wildcats rose to 3, thus forcing the remaining eleven to carry the load of the game against Culver-Stockton College. Baker played a strong first half and shot the three better than it had in any game of recent history at 3-10. The ‘Cats also received contribution from freshman Brock Mick, who took the ball to the rim halfway through the first half, drew the foul, and one. Mick played 20 minutes in the game, his season high. Baker led 31-25 at the break. This story of this game was definitely the second half. Baker jumped out red-hot from the break and began on a 13-0 run, in one of its most dominant runs and performances of the season. The offense was clicking, Guscott hit a big three, everything seemed to be going in Baker’s direction. With 14:24 to go in the game, Baker led by 17 and it appeared that the Wildcats were going to walk away with a monumental road victory. But Culver responded with a 7-0 run to cut the lead back to 10 and with 8:28 to play Baker led 50-38. Both teams swapped baskets for the next three minutes and with 4:49 to play Baker led by 11. Suddenly the game changed. Baker was starting to lose composure and began making mistakes; they turned the ball over in the backcourt, made errant passes, and were called for traveling. All these errors combined for 22 turnovers in the game for Baker including 6 from Guscott, 5 from Parker, and 5 from Carter. With 1:15 left and Baker leading by 6, Culver found its way to the free throw line after Fulks fouled out of the game on a breakaway lay-up. Culver made a free throw and then a three-point shot from Clay Crounch, cutting the lead to two. Baker turned it over again and Culver called a timeout with 57 seconds to play. Culver’s tactic was simple, drive to the basket. They did so with 47 seconds left and Jojuan Graham scored on a floater in the lane to tie the game for the first time since the score was 3-3. Culver made a bad error in fouling Parker off the break and he went to the line for two but he only made one with 40 seconds left. The home team was calm in taking the ball and going right back to its best man down low Dennis Hogan. Hogan scored on a contested shot at the rim and one and Culver was winning 63-61 with 24 seconds left. Parker led Baker back down the floor but had his shot was rejected by Hogan and Baker forced Culver back to the line for two, trailing by two. Culver missed the first, made the second. Baker had no timeouts and had to run the floor with 11 seconds left. Parker drove to the basket and kicked out to junior Cody Sunderland for a the game-tying three at the buzzer. Sunderland fired off a rushed, contested three and got the shot off in time, but missed. 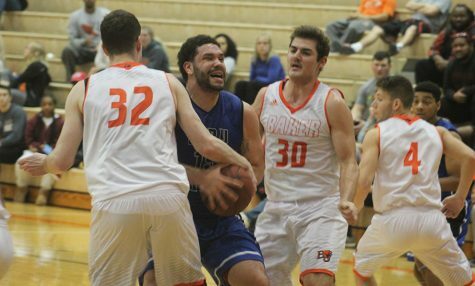 Culver-Stockton snapped a five game losing streak and overcame a 17-point second half deficit. Baker fell to 7-8 and 1-4 in HAAC play. Parker scored a team high 15 points followed by 13 from Carter. Sophomore Manny Barnes scored 7 along with Fulks. Baker finished 33 percent from the field and 4-18 from three-point territory. Baker is shooting a rough 12-58 from three in the last three games. Baker will be back in action at 7:30 p.m. Thursday at the Collins Center against a tough Avila team that Baker lost both games to last season. Avila is led by junior Sedrick Johnson, who was a first team all conference performer in 2013-2014. Johnson currently leads the HAAC in scoring at 19.5 points per game.